EverClip 2 – Clip everything to Evernote has just been released in the App Store! Take a look at all the details below and if you’re interested in more productivity apps for your iPhone and iPad, check out our selection of the Coolest Productivity Apps. Here comes the next generation EverClip. We take the award winning EverClip app and redesign it from the groud up to make it fast, natural and beautiful. Of course, we also added couple features you'd absolutely love. - Today Widget. Simply save items with Widget without opening the app. - Safari Extension. Add current web page within Safari. Copy any text, URL and images, open Today Widget, save the pasteboard content to EverClip. 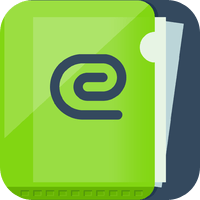 Later open EverClip to edit, annotate and organize clippings freely and send them to Evernote. We designed EverClip to simplify our clipping workflow. We hope you'll find it helpful and satisfying as we do! + Successor of the Evernote DevCup winner app! User of old EverClip? Please delete the old app before you launch the new app. Please email support@ignition.hk with support questions or your suggestions for future updates.